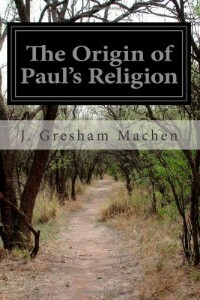 I have always loved reading Machen so I couldn’t resist reading this lesser known book. Machen was assistant professor of New Testament literature and exegesis at Princeton Theological Seminary. These lectures were delivered in 1921 at Union Theological Seminary. I must confess that it is the most difficult book that I have read from Machen. That is because, no doubt, he was defending the New Testament record of Paul and his writings in the center of modernism and rationalistic thought. It is an amazing thing to see those early “fundamental” men defending the integrity of God’s Word at a level far beyond the average Christian today. It is a rewarding reading if one has time to put his reading lever in first gear and walk through Machen’s thoughts slowly and thoughtfully.